PIETA HOUSE WALK AND TALK : Pieta House in conjunction with the Community Council will hold a Walk and Talk in Adare on Sunday November 1 in support of Pieta House and Suicide Awareness. The walk starts at Adare Heritage Centre at 2pm with the talk in the Village Hall at 3pm. NOVEMBER MASS FOR DECEASED PARISH MEMBERS : The annual mass for those deceased during the last year from the parish will take place on Saturday November 7 in Patrickswell Church at 6.30pm and in Ballybrown Church at 8.00pm. BISHOP LEAHY VISITS BALLYBROWN : On Sunday morning last Bishop Brendan Leahy paid a visit to Ballybrown and attended the 10 o’clock mass. Afterwards he met and spoke with all the children who will be making their first communion in May 2016. He was welcomed by Fr. Michael Cussen our P. P. and by Arch Deacon Michael Lane who celebrated mass. He attended at a reception for him at the Ballybrown Resource Centre where he had plenty of time to chat and share a cup of tea with the local parishioners. Liam Coughlan, Michael McNamara and Ted O’Leary escorted him down to Newtown to see the beautiful monument “The Sailor’s Haggard” and he was amazed at the workmanship that had gone into this project. He then paid a visit to our Grotto down in Tervoe and he was equally amazed at what is termed the first Lourdes Grotto to be erected in Ireland. He has promised that he will come back to celebrate mass there in May 2016 if his diary allows. We extended a big Ballybrown welcome to Bishop Leahy and we hope that he will come to visit us again in the near future. 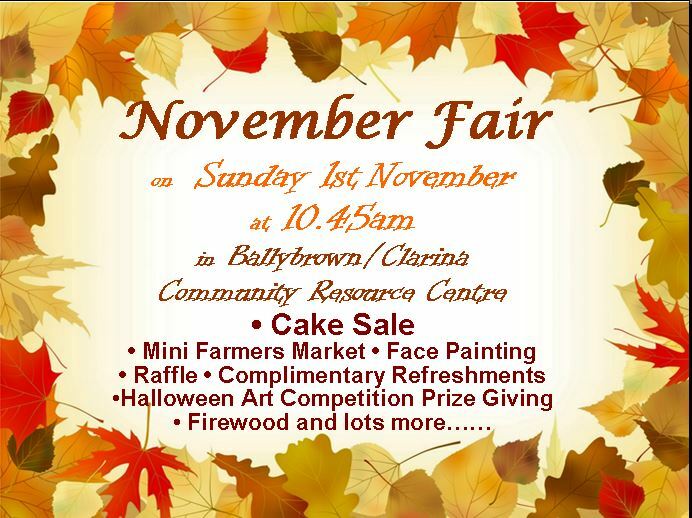 NOVEMBER FAIR IN RESOURCE CENTRE ON SUNDAY NOVEMBER 1 AT 10.45AM : Cake Sale – Mini Farmers Market – Face Painting – Raffle – Complimentary Refreshments Halloween Art Competition Prize Giving- Firewood and lots more. See you there ! Bishop Brendan Leahy will celebrate mass on Sunday 25th October at 10.00am in Ballybrown Church. We are delighted to have him.